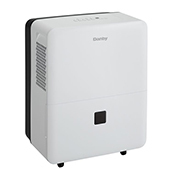 Our Danby Premiere Dehumidifiers are our most popular home dehumidifier. It is not hard to see why. Danby Dehumidifiers offer unmatched quality, styling and value to suit your every need in basements or rooms that tend to collect unwanted moisture. 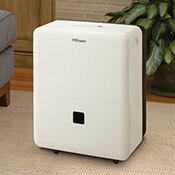 These low temperature dehumidifiers work down to 41°F and are loaded with much needed features such as adjustable humidity control, automatic shut off to prevent overflow, rear direct drain for continuous operation, auto-restart and an auto dry function to remove residual moisture and prevent bacteria and mold from forming. 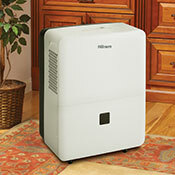 If you want more options, see our complete selection of basement dehumidifiers. Over the years, Danby Premiere Dehumidifers has built a solid reputation and excellent ratings and reviews due to their energy efficient and reliable dehumidifiers’ effectiveness in basements and other residential areas. Danby Premiere Dehumidifiers are extremely quiet if you want to use it in a finished basement area. Additionally, the airflow design of the Danby Dehumidifiers allows you to locate it against the wall if desired. You can choose to dispose of the water via emptying a bucket or draining water continuously via gravity. Danby low temperature dehumidifiers are loaded with consumer friendly features such as their easy to use digital humidistat, actual air temperature and humidity display, and auto restart to eliminate potential humidity issues due to power outages. Overall, Danby Premiere Dehumidifiers are compact and attractive with user-friendly digital controls and settings.